President Barack Obama's March 20 memo was quite clear on stimulus lobbying: every communication between a lobbyist and a government agency regarding the stimulus has to be documented, and those records have to be posted. We know that, like any giant pot of government money, the American Recovery and Reinvestment Act attracted lobbyists' interest. Lobbyists have long been required to give Congress quarterly disclosure reports outlining their lobbying efforts. 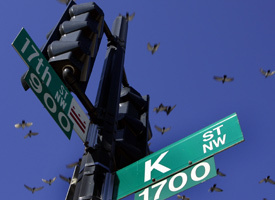 In the latest quarterly reports, no less than 871 lobbyists indicated lobbying on the stimulus. Given that lobbyists' job is to serve as go-betweens for their clients and government agents, what are the droves of stimulus lobbyists now doing? There were only a few days of overlap between the start of the March 20 requirement for agencies to report conversations with lobbyists and the filing deadline for the first-quarter reports to Congress. So much of the lobbying shown in the congressional reports did not require agencies to post records. Still, the first-quarter lobbying reports show that there were many stimulus lobbyists with many stimulus clients. The fact that so few of those lobbyists have made contact with agencies over the two months is striking. Holland & Knight, a lobbying firm that boasted to the Washington Post in March about having 240 stimulus clients, hasn't filed a single one of the contact disclosures appearing on agency Web sites. But those agencies report no contacts from the firm after the new regulations went into effect. "Nobody's losing business on the stimulus," said Dave Wenhold, president of the American League of Lobbyists. Meanwhile, lobbyists are training their clients to attend meetings on their own. "The lobbyists will bring in clients, train them, then have them meet," said Wenhold. Some lobbyists will even go so far as to "go right up to the meeting point and drop them off, kind of like dropping a kid off at school," he said. Other lobbyists are helping their clients while still apparently keeping arms-length from agencies. Manzano Strategies said in its filings it lobbied the departments of Agriculture, Commerce, Energy, Homeland Security, Justice, Transportation and Veterans Affairs to help the County of Sandoval in New Mexico secure stimulus funding. But not a peep from them in the agencies' contact disclosures now required by the Obama administration. The explanation: employees of the firm gathered information on how to get stimulus funding for county employees, said Bruce Donisthorpe, vice president of government relations at Manzano. "We used some contacts to get information about timelines and process," he said.